The Winnipeg General Strike of 1919 was one of the most famous and influential strikes in Canadian history. Labour union leaders argued that many Winnipeg companies had enjoyed enormous profits on World War I contracts, but wages were not high enough, working conditions were dismal and the people had no voice in the shops. In March 1919, labour delegates from across Western Canada convened in Calgary to form a branch of the "One Big Union", with the intention of earning rights for Canadian workers through a series of strikes. Their goal was to mobilize workers (including those who already belonged to established unions), including all different trades, skill levels, and ethnicities, giving them class solidarity and aggressive leadership. Business leadership controlled the political system in Manitoba, and used force to break the strike and effectively destroy the One Big Union. Newsreel footage of the Winnipeg general strike of 1919. The immediate post-WWI war period in Canada was not a time of peace. Social tensions grew as soldiers returned home to find large numbers of immigrants crowded into cities and working at their former jobs. High rates of unemployment among returned soldiers compounded their resentment towards the immigrants. Along with the soldiers, the Spanish flu was brought back from Europe, causing an epidemic within the country. Canadian Prime Minister Robert Borden attended the Paris Peace Conference that concluded the Great War and was concerned primarily for his government, due to the Russian Revolution that began more than a year before the settlement and concern that Bolshevism would potentially spread to North America. Canada's large immigrant population was thought to hold strong Bolshevist leanings. Government fears of a possible uprising led to increased efforts to control radicals and immigrants at home. Threats and incidents of strike action, which were considered by authorities to be signs of radical beliefs, were thought to require prompt, harsh responses. Soldiers returned home desiring jobs and a normal lifestyle again only to find factories shutting down, soaring unemployment rates, increasing bankruptcies and immigrants taking over the veterans' former jobs, which caused social tensions. The cost of living was raised due to the inflation caused by World War I, making it hard for families to live above poverty. Another component which caused the strike was the working conditions of many factories that upset the employees, thus pushing them to make the changes that would benefit them. Railways in particular were put in the prairie climate, and many of the employees were hurt around the mountains due to rock falls and the misuse of explosives. Sleeping there, the workers stayed in tents with unsanitary and overcrowded bunkhouses. At first, many workers liked the ideal wage pay, but the company deducted charges for staying overnight, transportation and blanket rental, making the workers motivated to revolt against the company. After three months of unproductive negotiations between the employers of the Winnipeg builders exchange and the union, worker frustration grew. The city council's new proposal to the workers was unsatisfactory to the four departments, electrical workers took action and a strike was established. Waterworks and fire department employees joined a few days later. Strikers were labelled as Bolsheviks who were attempting to undermine Canada. The city council viewed this as unacceptable and thus dismissed the striking workers. This did not discourage the latter; instead, other civic unions joined the strike out of sympathy, which was an important feature of 20th century social history. On May 13, City Council gathered again to review and look over the proposed agreement issued by the strikers and their leaders. Once again, City Council did not accept the proposal without their own amendments, specifically the Fowler Amendment, which read that "all persons employed by the City should express their willingness to execute an agreement, undertaking that they will not either collectively or individually at any time go on strike but will resort to arbitration as a means of settlement of all grievances and differences which may not be capable of amicable settlement." This amendment incensed the civic employees further, and by Friday, May 24, an estimated total of 6,800 strikers from thirteen trades had joined the strike. Fearing that the strike would spread to other cities, the Federal Government ordered Senator Gideon Robertson to mediate the dispute. After hearing both sides, Robertson settled in favour of the strikers and encouraged Council to accept the civic employee's proposal. Bolstered by their success, the labour unions would use striking again to gain other labour and union reforms. In Winnipeg, workers within the building and metal industries attempted to strengthen their bargaining ability by creating umbrella unions, the Building Trade Council and Metal Trade Council respectively, to encompass all metal and building unions. Although employers were willing to negotiate with each union separately, they refused to bargain with the Building and Metal Trade Councils, disapproving of the constituent unions that had joined the umbrella organization, and citing employers' inability to meet proposed wage demands. Restrictive labour policy in the 1900s meant that a union could be recognized voluntarily by employers, or through strike action, but in no other way. Workers from both industrial groupings therefore struck to gain union recognition and to compel recognition of their collective bargaining rights. The Building and Metal Trade Councils appealed to the Trades and Labour Union, the central union body representing the interests of many of Winnipeg's workers, for support in their endeavours. The Trades and Labour Union, in a spirit of solidarity, voted in favour of a sympathetic strike in support of the Building and Metal Trade Councils. Ernest Robinson, secretary of the Winnipeg Trade and Labour Union, issued a statement that "every organization but one has voted in favour of the general strike" and that "all public utilities will be tied-up in order to enforce the principle of collective bargaining". By suspending all public utilities, the strikers hoped to shut down the city, effectively forcing the strikers' demands to be met. The complete suspension of public utilities, however, would prove impossible. The Winnipeg police, for example, had voted in favour of striking but remained on duty at the request of the strike committee to prevent the city from being placed under martial law. Other exceptions would follow. 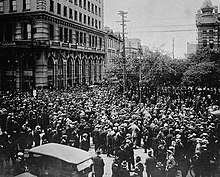 At 11:00 a.m. on Thursday May 15, 1919, virtually the entire working population of Winnipeg had gone on strike. Somewhere around 30,000 workers in the public and private sectors walked off their jobs. Even essential public employees such as firefighters went on strike, but returned midway through the strike with the approval of the Strike Committee. General strikes broke out in other cities, in solidarity with the Winnipeg strikers and in part as protest against local conditions. Edmonton, Calgary, Vancouver, Amherst, Nova Scotia and several other cities were locations of these sympathy strikes. Victoria, British Columbia held a general strike in protest at the police repression on Bloody Saturday and to show local labour strength. The local newspapers, the Winnipeg Free Press and Winnipeg Tribune, had lost the majority of their employees due to the strike and took a decidedly anti-strike stance. The New York Times front page proclaimed "Bolshevism Invades Canada." The Winnipeg Free Press called the strikers "bohunks," "aliens," and "anarchists" and ran cartoons depicting radicals throwing bombs. These anti-strike views greatly influenced the opinions of Winnipeg residents. However, the majority of the strikers were reformist, not revolutionary. They wanted to amend the system, not destroy it and build a new one. When certain unions refused to comply with various demands they were dismissed and replaced without any second chances. In regards to this, the Federal government opposed the dismissal of the Winnipeg police force and afterwards refused to step in when the police force was dismissed by the city thus creating the workforce called the "specials". Through a greater perspective, the most opposed to the strike was the state including three levels of government: federal, provincial and municipal. The opposition could have been more efficient if they coordinated their policies and deals with each other rather than gradually working into the agreement and not being the total opposition that they were labelled in the first place. At a local level, politicians showed sympathy for the strikers making them neither a monolith nor unalterably an enemy. The federal government's only direct interest in the general strike other than calls from the local authorities was keeping the railroads and post office running. A counter-strike committee, the "Citizens' Committee of One Thousand", was created by Winnipeg's elite, among whom were A. J. Andrews, James Coyne, Isaac Pitblado, and Travers Sweatman, all four of whom would later co-prosecute the sedition. The Committee declared the strike to be a violent, revolutionary conspiracy by a small group of foreigners also known as "alien scum". On June 9, at the behest of the Committee, the City of Winnipeg Police Commission dismissed almost the entire city police force for refusing to sign a pledge promising to neither belong to a union nor participate in a sympathetic strike. The City replaced them with a large body of untrained but better paid special constables who sided with the employers. Within hours, one of the special constables, a much-bemedalled World War I veteran Frederick Coppins, charged his horse into a gathering of strikers and was dragged off his horse and severely pummelled. The Citizens' Committee saw the strike as a breakdown of public authority and worried that the Strike Committee was attempting to overthrow the Canadian government. The Citizens' Committee met with federal Minister of Labour Gideon Robertson and Minister of the Interior (and acting Minister of Justice) Arthur Meighen, warning them that the leaders of the general strike were revolutionists. Meighen issued a statement May 24 that he viewed the strike as "a cloak for something far deeper--an effort to 'overturn' the proper authority". In response, he supplemented the army with local militia, the Royal Northwest Mounted Police and special constables. Legislation quickly passed to allow for the instant deportation of any foreign-born radicals who advocated revolution or belonged to any organization opposed to organized government. Robertson ordered federal government employees back to work, threatening them with dismissal if they refused. The two ministers refused to meet the Central Strike Committee to consider its grievances. On June 10 the federal government ordered the arrest of eight strike leaders (including J. S. Woodsworth and Abraham Albert Heaps). 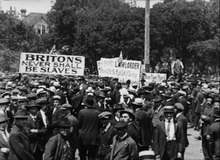 On June 21, about 30,000 strikers assembled for a demonstration at Market Square, where Winnipeg Mayor Charles Frederick Gray read the Riot Act. 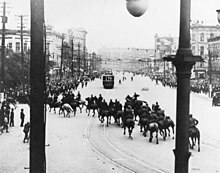 Troubled by the growing number of protestors and fearing violence, Mayor Gray called in the Royal Northwest Mounted Police who rode in on horseback charging into the crowd of strikers, beating them with clubs and firing weapons. This violent action resulted in the death of two strikers Mike Sokowolski (shot in the heart) and Mike Schezerbanowicz (shot in the legs, later dying of gangrene infection), 35 to 45 people injured (police, telephone operators, firemen, utility workers and labourers) and numerous arrests. Four Eastern European immigrants were rounded up at this time (two of them were deported, one voluntarily to the United States and the other to Eastern Europe). This day, which came to be known as "Bloody Saturday", ended with Winnipeg virtually under military occupation. Interacting with other prisoners that consisted of editors and strikers, police shut down the striker's paper called the Western Labour News and arrested the editors for commentating on the event. Eight of the strike leaders arrested on June 18 were eventually brought to trial in what were called "state trials" of political crimes. Seven (including R.B. Russell, George Armstrong, W.A. Pritchard, R.J. John, Reverend William Ivens, and Alderman John Queen) were found guilty of the charges laid against them. Their jail sentences ranged from six months to two years. Russell, Armstrong, Ivens and Queen ran for the Manitoba Legislature in the next election, while still in jail. Armstrong, Ivens and Queen were elected. Heaps declined legal counsel and defended himself and became the only member of the accused to be found innocent. Despite being tried for seditious conspiracy as a result of his leadership in the strike, Heaps went on to become the Member of Parliament for Winnipeg North from 1925 to 1940, gaining national recognition as an astute economic critic, skilled debater and supporter of national social welfare measures, and forming lasting friendships with both William Lyon Mackenzie King and R. B. Bennett. Sam Blumenberg and M. Charitonoff were scheduled for deportation. Only Blumenberg was deported, having left for the United States. Charitonoff appealed to Parliament in Ottawa and was eventually released without deportation. The lack of criminal proceedings taken against them was taken as evidence that their arrests were part of a government ruse so as to continue the fiction that foreigners, not British born, were the "agitators" of the strike. The government dropped charges of seditious libel against J. S. Woodsworth, whose "crime" was quoting in the strike bulletin from the Bible. Woodsworth was elected MP in the next federal election as a Labour MP and went on to found and lead the Co-operative Commonwealth Federation, a forerunner of the New Democratic Party. After the strike many employees had mixed emotions about the solution the mayor provided for them. The metal workers received a reduction from their working week of five hours but did not receive a pay increase. Many of these workers lost their pension rights and a deeper division of working class and business was present. The newly civic employees were obligated to sign an oath promising not to partake in any sympathetic strikes in their future. Among the Bloody Saturday strikers, many lost their jobs and others resumed their previous jobs but were placed at the bottom of the seniority level. The Royal Commission which investigated the strike concluded that the strike was not a criminal conspiracy by foreigners and suggested that "if Capital does not provide enough to assure Labour a contented existence ... then the Government might find it necessary to step in and let the state do these things at the expense of Capital." This strike is now considered the largest rail strike in Canadian history and debated to be the largest in North America. Organized labour thereafter was hostile towards the Conservatives, particularly Meighen and Robertson, for their forceful role in putting down the strike. Combined with high tariffs in the federal budget passed in the same year (which farmers disliked), the state security forces' heavy-handed action against the strikers contributed to the Conservatives' heavy defeat in the 1921 election - they lost every one of their seats on the Prairies. The succeeding Liberal government, fearing the growing support for hard left elements, pledged to enact the labour reforms proposed by the Commission. The strikeleaders who had at least faced charges if not served time in prison (such as Woodsworth mentioned above) were applauded as labour's champion and many were elected to serve in provincial and federal governments. The role of women during that time period played an influential part when dealing with the strike. As active citizens, various women were among the crowds joining the bystanders, sightseers and victims at major rallies and demonstrations. The division of women in the province included the strikers and women called "scabs" that were against the strike and tried every way to end it. Striking women would unplug the telephone operators and the scabs would plug them back in. It was especially hard for the women at home due to the low income and absence of goods and services to survive weekly as well as fully depending on their own salary. By 1919, women constituted roughly one-quarter of that labour force, mainly working in the service, clerical and retail parts of the economy. Around 500 women workers walked off after the first call of the strike, followed by hundreds more days later. The Young Women's Christian Association provided emergency accommodations to women who lived far away from their job. They accepted women strikers and non-strikers to get through the strike with ease. A major figure rose named Helen Armstrong, who was head of the local branch of the women's labour league, accompanying husband George Armstrong, who was one of the strike leaders. Helen was responsible for the women's kitchen maintained by the women's league to feed the striking women. Male strikers were allowed to come to the kitchen to eat but had to provide a good reason as well as sometimes even paying for their meal. Being arrested and put in jail, Helen made the media with names like "the wild women of the west" and "business manager for the women's union". Among many other women who were sent to jail, Armstrong was granted a substantial bail of $1,000. When newspapers and articles commented on the strike and the women involved, the Winnipeg Tribune referenced to many of the rioting women as having accents thus labelling them as foreigners whenever something was published. After the strike concluded many women came out for "ladies day" at Victoria Park on June 12 and occupied seats of honour near the front cheering along with J. S. Woodsworth promoting emancipation of women and the equality of the sexes. It has been erroneously reported that the Strike and Woodsworth's support advanced "the cause of women." In fact, women's suffrage was achieved provincially in 1917, due to the strenuous advocacy and activism of Winnipeg women like Lillian Beynon Thomas and Nellie McClung. Studies done by David Bercuson, author of various pieces on radicalism in the westernized society, state that radical unionism was essentially a western phenomenon attributed to the rapid development of a resource-based industrial economy that fostered intense class conflict. A playwright, Danny Shur, wrote and produced the musical Strike in 2005. He revisited the Winnipeg general strike after stumbling across pictures never before made public. According to Shur, the streetcar was rocking and was not fully tipped over, although police said its overturning was the reason the police acted violently, killing two people. Anti-strikers claim that the tipped streetcar was the catalyst for the violence and the shootings, so discovering these photos amazed Shur. Historian Donald Avery, with knowledge of the ethnic labour movement in Winnipeg, declared that no one has written of the important role of immigrant workers in the Winnipeg general strike of 1919. According to Avery it is clear from the evidence that no non–Anglo-Saxon leader played a particularly significant role in the strike. Another author, J. E. Rae, depicted the notion that the strike established Winnipeg's class division so severely in the decades after that Winnipeg had a marked class polarization. David Yeo and his article "Rural Manitoba view the 1919 Winnipeg general strike" sheds light on the expressed view that the rural community was hostile to the strike and undermined the chances of farmer-labour cooperation's years after the strike. Mary Horodyski showed that the thousands of women who were active as strikers and striker-breakers. Horodyski states that one in four workers in the city was female and even if they did not participate solely in the strike, they were affected on the sidelines trying to feed protesters while feeding their own families daily. There are different viewpoints in regards to the west and the east of the city of Winnipeg. Historians of the labour revolt in east part of Winnipeg deem the eastern workers as innately conservative. Many essays by historians show that maritime labour revolt went further than the radical violent battles in the Cape Breton coal fields to range elsewhere in the country. Indifferently on the western side radicalism is played down and depicted strikes as strategies rather than ideological commitments to settle certain demands. There are many viewpoints that historians have that open new perspectives that may have been left out before. With these different and unique feedback about Canadian history, people from the present and the future can understand what really happened in Winnipeg during the famous general strike of 1919. Many of the famous photographs of the strike were by Winnipeg photographer L. B. Foote. Among the remembrances of this event in Canadian popular culture is the song "In Winnipeg" by musician Mike Ford, included in the album Canada Needs You Volume Two. FOX, by author Margaret Sweatman, is a work of historical fiction about the events leading up to and following the Winnipeg General Strike. In 2005, Danny Schur created a musical based on the event called Strike!. There is a mural commemorating the General Strike in Winnipeg's Exchange District. ^ a b c Francis, Daniel (1984). "The Winnipeg General Strike". History Today. 38: 4–8. ^ a b Bumsted, J. M. (1994). The Winnipeg general strike reconsidered. Beaver, 74(3), 27. ^ Bumsted, J.M (1994). The Winnipeg General Strike of 1919: An Illustrated Guide. Watson Dwyer Publishing Limited. pp. 2–3. ISBN 0-920486-40-1. ^ Fowler Amendment, as quoted in Bumsted, J. M. (1994). The Winnipeg General Strike of 1919: An Illustrated History. Watson Dwyer Publishing Ltd. p. 1. ISBN 0-920486-40-1. ^ as quoted in Bercuson, David Jay (1990). Confrontation at Winnipeg: Labour, Industrial Relations, and the General Strike. Montreal & Kingston: McGill-Queen's University Press. p. 62. ISBN 0-7735-0794-9. ^ a b Bumsted, J. M. (1994). The Winnipeg General Strike of 1919: An Illustrated Guide. Canada. p. 28. ISBN 0-920486-40-1. ^ Mitchell, Tom and James Naylor, "The Prairies: In the Eye of the Storm." In The Workers' Revolt in Canada, 1917-1925 (Toronto: University of Toronto Press, 1998) pp. 176-180. ^ name="Bumsted, J. M. 1994"
^ 'Labour / Le Travail' Journal of the Canadian Committee on Labour History: "Legal Gentlemen Appointed by the Federal Government: the Canadian State, the Citizens' Committee of 1000, and Winnipeg's Seditious Conspiracy Trials of 1919-1920"
^ Kramer, Reinhold; T. Mitchell (2010). When The State Trembled: How A.J. Andrews and the Citizens' Committee Broke the Winnipeg General Strike. Canada: University of Toronto Press. p. 443. ISBN 978-1-4426-4219-5. ^ Bumsted, J.M (1994). The Winnipeg General Strike of 1919: An Illustrated Guide. p. 37. ^ Justice H. A. Robson's report, quoted in Fudge, Judy; Tucker, Eric (2004). Labour Before the Law: The Regulation of Workers' Collective Action in Canada, 1900-1948. Toronto: University of Toronto Press. p. 112. ISBN 0-8020-3793-3. ^ a b Horodyski, M. (2009, April 25). Manitoba History: Women and the Winnipeg General Strike of 1919. ^ Bercuson, David Jay. "Confrontation at Winnipeg:." Google Books. McGill-Queens University Press 1974, n.d. Web. ^ Prokosh, Kevin. "History Revisited." - Winnipeg Free Press. Winnipeg Free Press, 29 Sept. 2011. Web. Bumsted, J.M. The Winnipeg General Strike of 1919: An Illustrated Guide (Watson Dwyer Publishing Limited, 1994). ISBN 0-920486-40-1. Masters, Donald Campbell. The Winnipeg general strike (University of Toronto Press, 1950), a scholarly history. Stace, Trevor. "Remembering and Forgetting Winnipeg: Making History on the Strike of 1919." Constellations (2014) 5#1 on the historiography of 1919; online. This page is based on the Wikipedia article Winnipeg general strike; it is used under the Creative Commons Attribution-ShareAlike 3.0 Unported License (CC-BY-SA). You may redistribute it, verbatim or modified, providing that you comply with the terms of the CC-BY-SA.